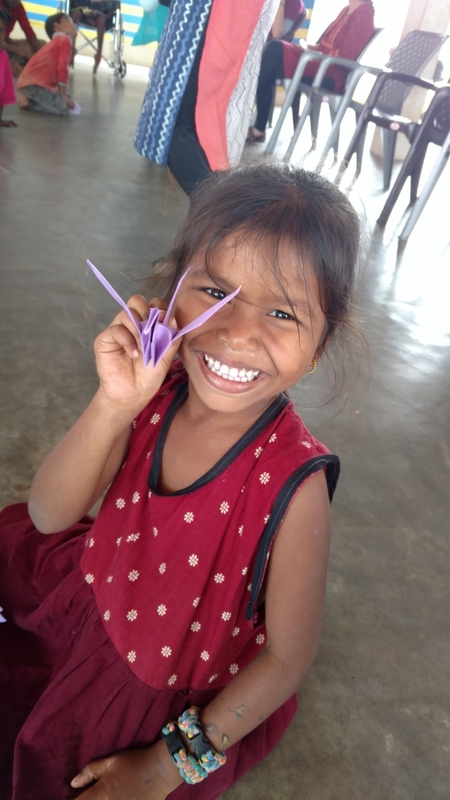 The short-term mission trip with Grace Partner Hands of Hope to Faith in Deeds Children’s Home (FID) in India was truly amazing and more extreme than I had imagined. I could make a long list of wonderful things that made the trip so great, but I’ll just highlight a few moments that God has stamped in my heart and engraved deeply into my core. After several years of supporting FID from afar, finally meeting the children was overwhelmingly grateful experience. Their big smiles I admired through Facebook postings were even more stunning when I saw them in person. Their faith and love were so genuine, pure, enthusiastic and full of life… just beautiful. Yet God also met me in a deeper level. For my third morning devotion in India, I read in Acts and there were passages that stood out. Saul was persecuting people following the Way, not Jesus himself, and Cornelius was giving gifts to the poor, not God himself (or so they thought). But the truth was startling. Jesus didn’t say, “Why are you persecuting my beloved people?” God didn’t say, “Good job for helping the poor.” Jesus told Saul, “You are persecuting ME, Saul.” Likewise, God’s angel told Cornelius that his gifts to the poor have been received by God Himself. When I met the kids that day, I realized what these messages really meant. I saw Jesus in every child’s face. Jothi and Jesus’ smiles overlapped. Palavee’s big eyes were looking at me with Jesus’ eyes. Karthic and Madhu’s care for each other showed Jesus’ love for each other, and on and on and on. Oh, my heart! What Jesus said was much more literal than I had thought. It was not a metaphor. It was the letter-for-letter truth. I was encountering Jesus. Jesus not only loved each of them dearly, He WAS each child, inviting me into a relationship with them, thus with Him. Who am I to turn away when I am face to face with Jesus? Who am I not to smile back when my Lord shows up in a biggest smile on child’s face? Who am I not to hug back when he is reaching out to hold me? So yes, the trip gave me tangible memories that I will cherish forever and approach my life differently going forward. I am so grateful and humbled that God gave me the opportunity and I long to learn more about His endless and amazing love. At Grace, we talk so much about figuring out what God's call is on your life. Trips are a great way to discover how to do just that. God will open your eyes in new ways you could never have known by stepping out on a short-term trip. If you want to experience this, visit gracechurch.us/trips or handsofhopein.org to learn more about going on an upcoming short-term mission trip and encountering God in new ways!